There is no need to panic when your furnace or air conditioning system fails. When you hire the professionals at Champion AC & Heating Repair, you are hiring years of experience. You are hiring a company with a commitment to your satisfaction with every service call we make. You are hiring a company that takes each job seriously, no matter how large or small. And you are hiring our reputation as the most comprehensive furnace repair and AC repair technicians in the Stouffville area. We wear our confidence with pride.. When it comes down to quality workmanship, it pays to hire the right company for the job. Our customers in the Stouffville area recommend us time and again for repair and installation services. And they have good reason. We have the experience and the know how to diagnosis and repair your furnace or air conditioning system and get it up and running efficiently. These are indicators that your heating or cooling systems may be experiencing a breakdown. Don’t wait for an emergency situation. Is your equipment old or outdated ? Has it not been regularly maintained? Regular maintenance is always a good idea but when maintenance hasn’t been done regularly, the next best approach is a proactive one. Calling a company with a long track record of reliable service should be your next step. If you are in the Stouffville, Ontario area, you are in luck for your furnace repair or air conditioner (AC) repair concerns. 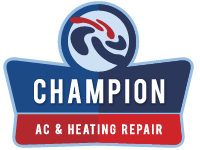 Champion AC & Heating Repair is hands down your best choice for quality and reliability. When repairs are necessary, our trained technicians will quickly diagnose and assess the problem, then make recommendations with your best interest in mind. There is no reason to be alarmed when we are on the job. We have built relationships over the years by being honest and honoring our customers’ wishes. .We want to be your company for the long haul. So we will always consider your needs first. If you are primarily concerned with money, we will make every attempt at finding the most cost effective approach available. If you are looking to upgrade, we will arm you with all information available so you can make an informed decision. We value your time and will make emergency visits promptly and repairs efficiently. Why Champion AC & Heating Repair ? In the Stouffville, ON area, our reputation is unrivaled. Whether you require furnace repair or AC repair, you would like to set up a regular maintenance schedule, or you would like information about installing an updated energy efficient system, we are the place to trust. Each of our professional technicians is fully prepared to assist you with the service or installation of the comfort system that is ideal for your family’s needs, lifestyle and budget. Whether it is new installation, a routine service or an emergency repair, our trained technicians provide the expertise you rely upon. Do you have an emergency? Call us today for your repair needs. Or call us for maintenance or installation. Let us be your loyal experts in the heating and cooling business for all your furnace and air conditioning requirements. We guarantee you will become one of our happy, long term customers. Value and comfort. With Champion AC & Heating Repair, you get both.